So, about that whole “absolutely no posters in the right of way” thing? Where Jonas got arrested and served while Evolve was starting, with fines of over $4,000? 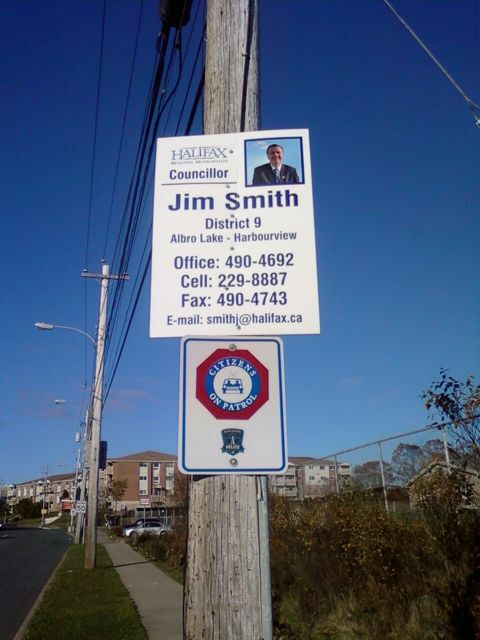 Because, you know, the by-law says, on page 13 of S-800 “Signs are not permitted within an HRM public right-of-way except for” posters in approved places? But can be approved through 7.1 (e). So what the heck is this? Taken today on Highland Park Drive in Dartmouth, right after Victoria Road. So, unless you are friends with Boss Hogg, who runs Hazzard County, you, you my son, are not important enough to be allowed to poster in the right of way? I am going to ask city staff to show me the permit for this sign. It ain’t even a flush mount poster!